With extensive experience in arboriculture since 1905, MAF RODA AGROBOTIC began its grading machine development and production business in 1962. With its comprehensive mastery of the mechanical, electronic and automatic systems of the solutions proposed, MAF RODA AGROBOTIC offers a wide range of tools for meeting your needs, in terms of both product processing and performance. 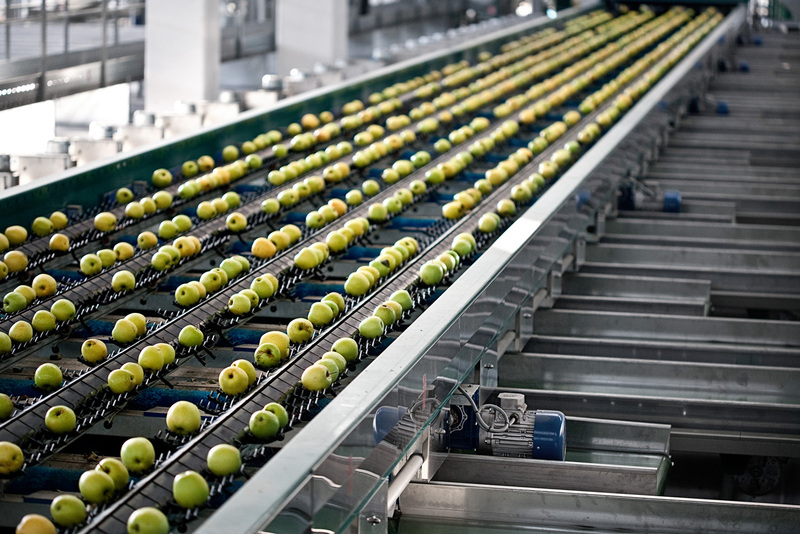 Below you will find the complete current range of fruit and vegetable graders that are developed and manufactured in our own MAF RODA AGROBOTIC factories. For any particular requests regarding your fruit and vegetables, please get in touch. You will find all our contact details on the Contact page. The Pomone is the flagship reference at MAF RODA AGROBOTIC. Out of our entire range of graders, it is the system with the greatest versatility in terms of capacity to process fruits and vegetables according to diameter and shape. 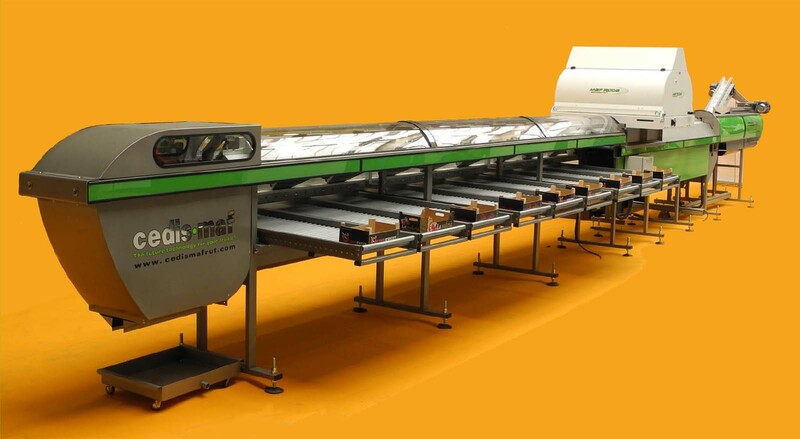 Its design makes it capable of multi-product grading with constant careful handling of delicate fruits and vegetables throughout the entire sorting and packaging cycle, without transfer, notably through the use of reception brushes or bicones coated with a flexible material, for example. 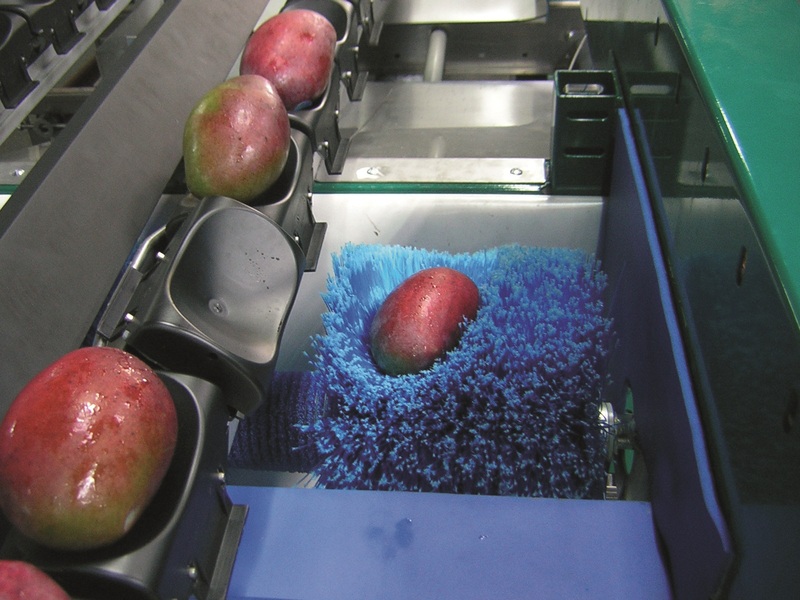 Capable of receiving the entire range of MAF RODA AGROBOTIC sensors, the Pomone also demonstrates its efficiency in fruit analysis: 100% of the surface is analysed, with a good sort-quality ratio, good results optimisation, good 3D reconstitution, and a high-performance system of dual-sensor cameras (colour and infrared). The Uniway P-76/100 is an electronic, single-lane and multi-lane (odd and even) grader that can be fed from both sides. It can be used for working on cylindrical fruits of diameters between 25 and 90 mm (pitch 76) or between 35 and 120 mm (pitch 100). 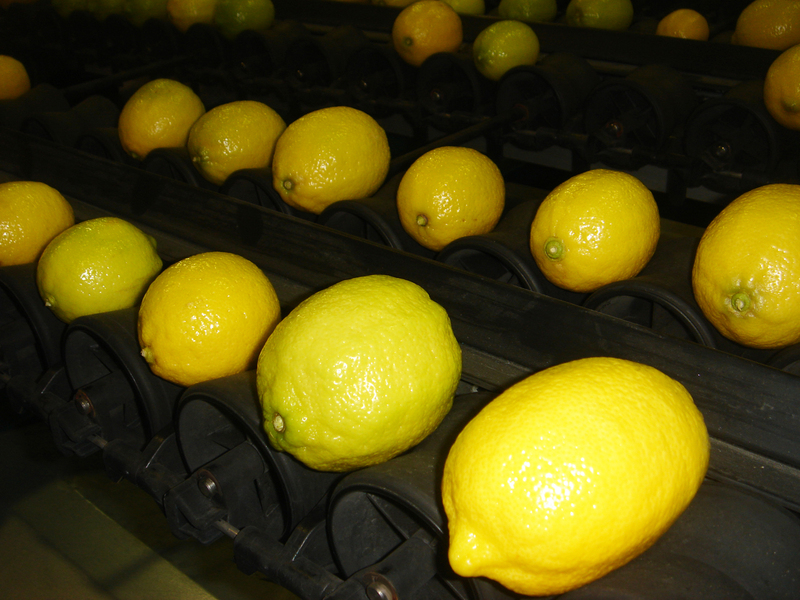 The rotation of the fruit enables the sensors to be deployed (colour, quality, sugar content, etc.). This grader is efficient, quiet, robust and low on power consumption. 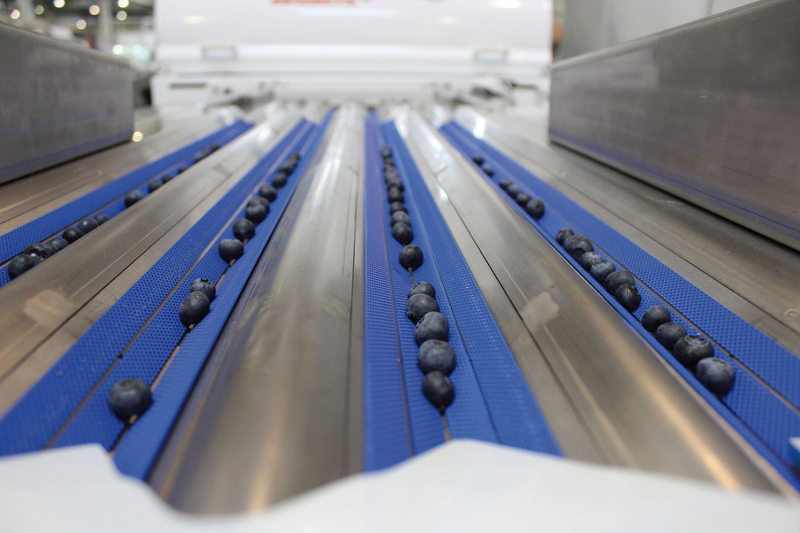 The Berryway is an electronic grader for the sorting and selection of blueberries. It can be used for working on cylindrical fruits of diameters between 9 and 25 mm. The integrated electronic sensor can analyse the entire surface of the blueberries thanks to the complete rotation of each fruit when passing beneath the camera. 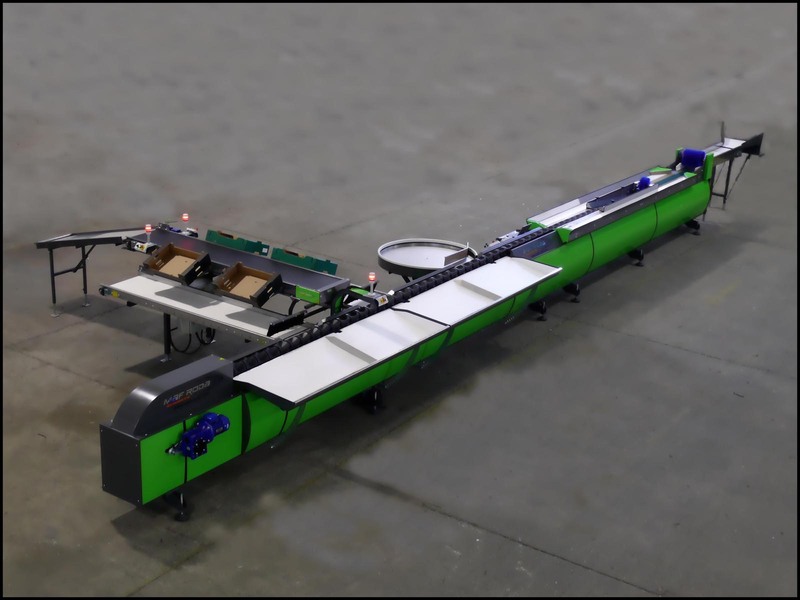 The Axone grader has been designed for the sorting and packaging of elongated vegetables such as aubergines, cucumbers, carrots, conference pears, etc. 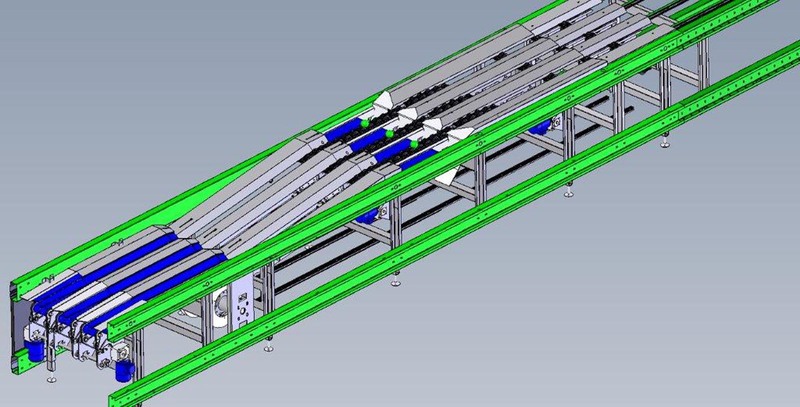 Axone is an asynchronous conveyor that offers fast product processing and simplified sorting operations. 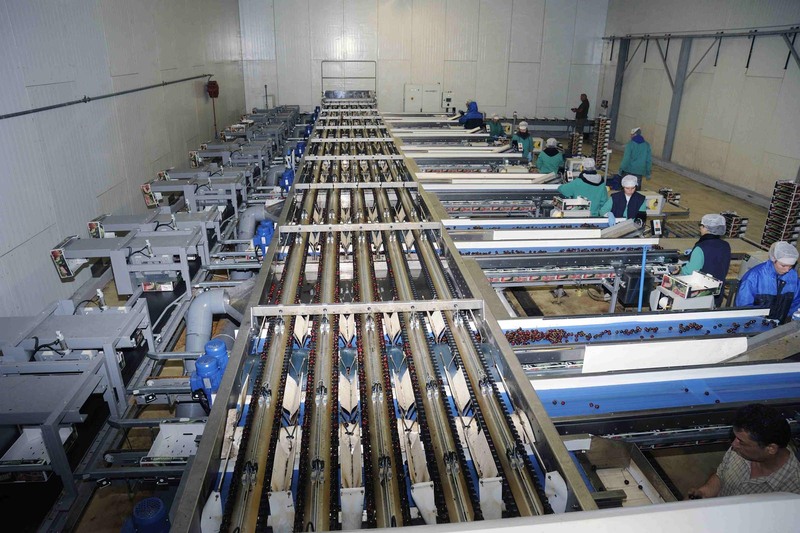 It is composed of a V-shaped pre-aligner for separating and isolating the items of produce before they pass beneath the cameras. The AXONESCAN optical system recognises the colour and dimensions of the product, as well as any defects of form or aspect. Depending on the image analysis results obtained by AXONESCAN, the ORPHEA program assigns to each product a preselected outlet. The Cherryfree is a grader for small fruits such as mini-plums, cherries or cherry tomatoes. Made of stainless steel, the grader's values, such as its attractive design and the low noise of the upper deck, make the Cherryfree the ideal machine for small production batches, ensuring high yield and sorting by size and colour, to perfection! The Cherryway, the fastest grader on the market, has been designed for small fruits, guaranteeing their perfect packaging. The Cherryway grader is coupled with the GLOBALSCAN CHERRY sensor for analysing the colour, the diameter, the shape and the internal and external quality of the fruit. Working in conjunction with the ORPHEA system, the solution enables control of the final destination of the fruit according to multiple possible selection criteria. The Exotica grader is a 10-inch cup grader especially designed for the grading of pineapples, grading them by weight and colour. Optiscan colour sorting and the ORPHEA interface enable adaptation to different sorting criteria in line with our customers' requests, and ensure homogeneity of the vended packages. The ORPHEA interface enables instantaneous production management of all batches passing through the grader. This database can be used for the internal management of the station. The Freeway P-88 has been designed for small fruits with "complex" shapes, such as plums, apricots, garlic or certain varieties of pear. 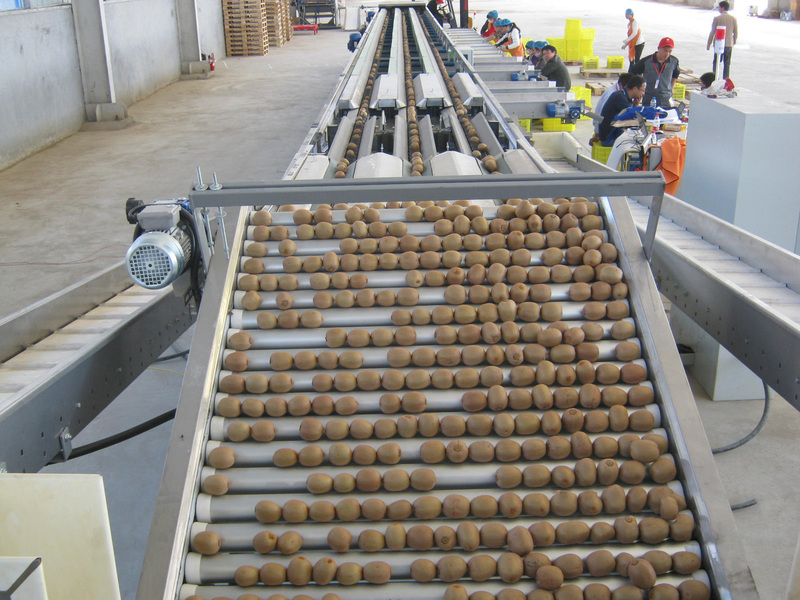 The production volume varies between 1000 and 2500 kg per hour, depending on the type of fruit. 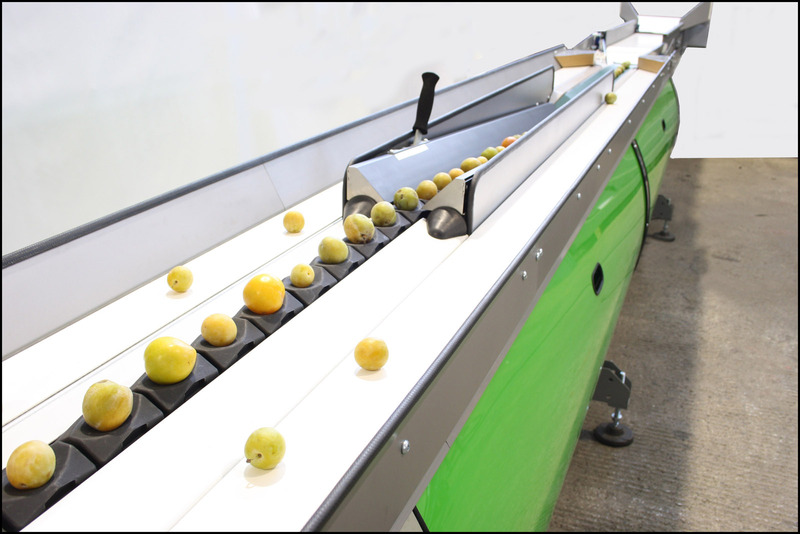 A fast-moving linear electronic grader (12 fruits per second), the Freeway P-88 guarantees high yield and excellent treatment of the fruit. This grader is available for one, two or a maximum of three lanes. The Freeway P-112 has been designed for "versatile" fruits such as peaches, flat peaches, pears and apples. 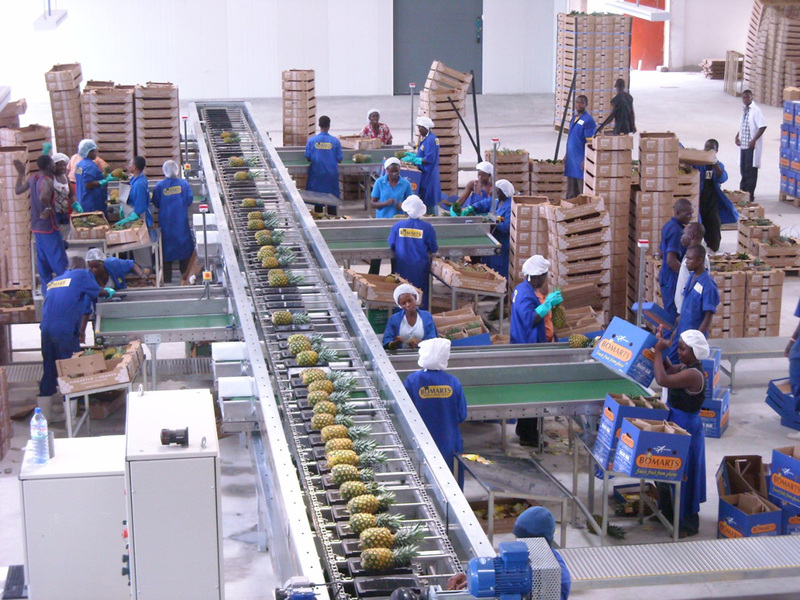 Its production volume can vary between 1000 and 4000 kg per hour, depending on the type of fruit. It guarantees high yield and delicate processing of the fruit, a combination that is hard to beat. The Freeway P-112 is available for one, two or a maximum of three lanes. 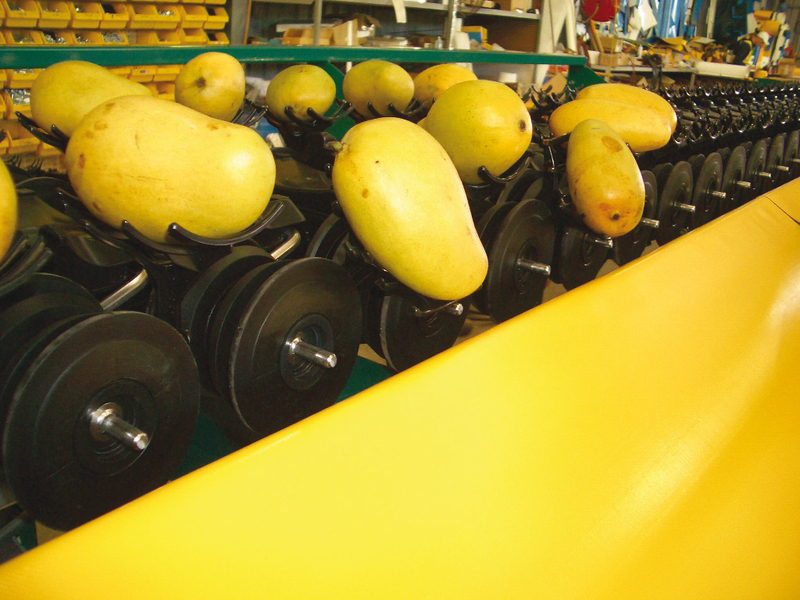 The Freeway P-152 has been designed for spherical or ovoid fruits such as avocados, mangoes, melons or pears. Its cups, designed to tip and deposit the produce, are 152 mm-pitch with four support points, for reliably precise weighing. An extremely fast grader, it looks innovative and elegant, with infeed brushes for the arrival of the fruit. Easy to use and maintain, the Freeway P-152 takes up less space. sugar content (with a larger number of sensors). The Genesis handles various varieties of fruit and veg such as apples, pears, apricots, peaches, tomatoes, citrus fruits, garlic and onions, both efficiently and at an affordable price. 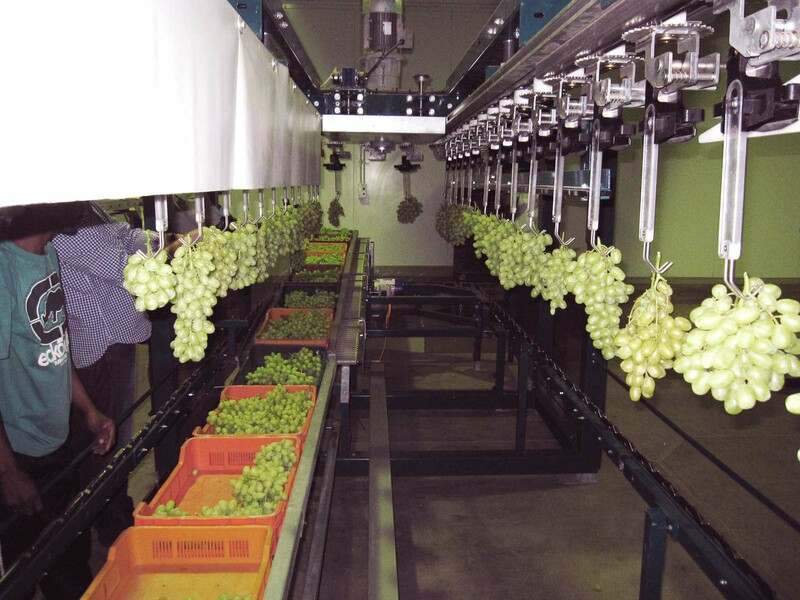 The Grapesizer is a latest-generation electronic grader, designed specially for the sorting and packaging of bunches of grapes. It enables the bunches to be sorted according to their colour, the grape size (dominant diameter) and their density (quantity of grapes on the bunch). The bunches may be green, red or black. 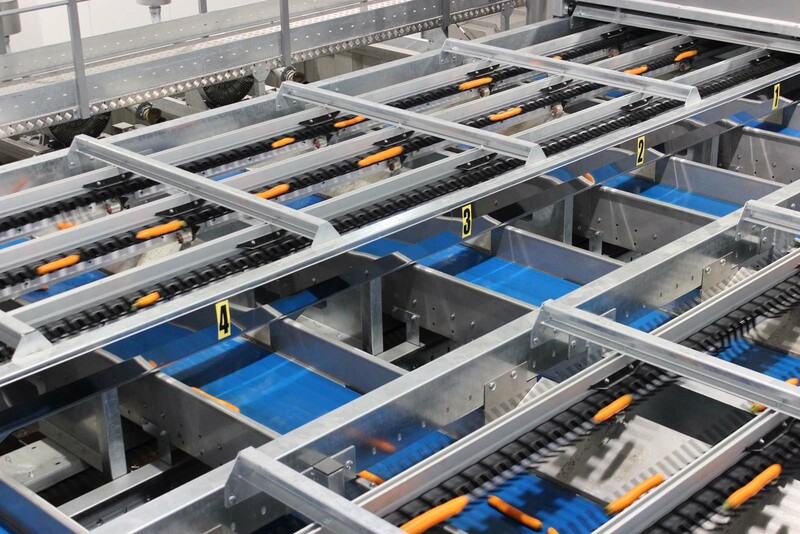 They are weighed individually, sorted together and accumulated at each outlet in order to produce crates with as close a weight as possible to the setpoint programmed by the operator (4.5 kg, 8.2 kg, 9 kg, etc.). 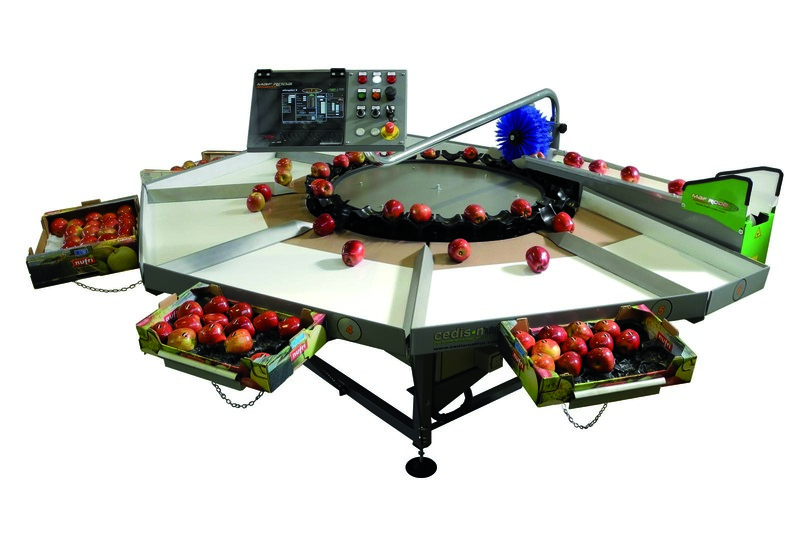 The Highway is a high-speed electronic grader for spherical fruits in optical mode (colour, diameter). It is generally used on fruits and vegetables such as citrus fruits, tomatoes, peaches, nectarines, kiwis, etc. The Integrita is a grader suited to small producers, with a maximum production of 500 to 1500 kg per hour (depending on the type of fruit and the manpower). 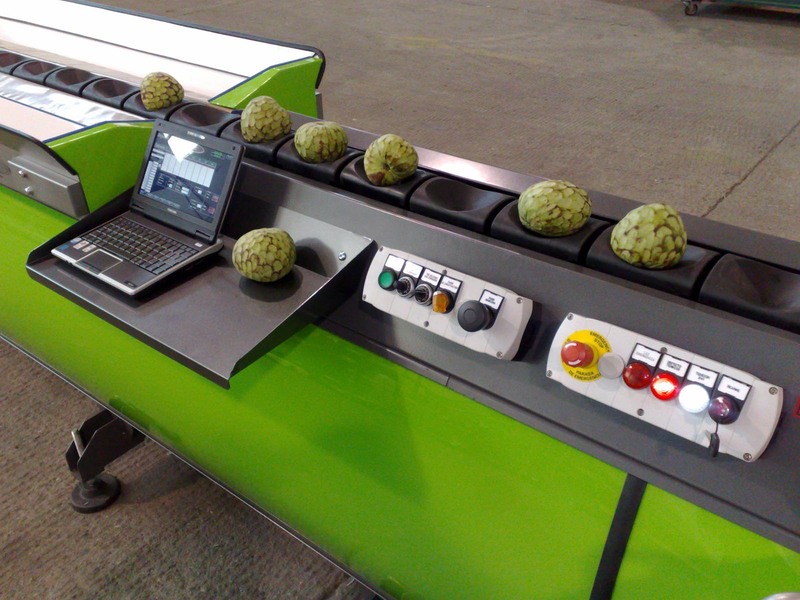 Equipped with the ORPHEA IT system, the grader is perfect for inspecting fruit per item, sample and batch, with the program linked up to the customer's PC. 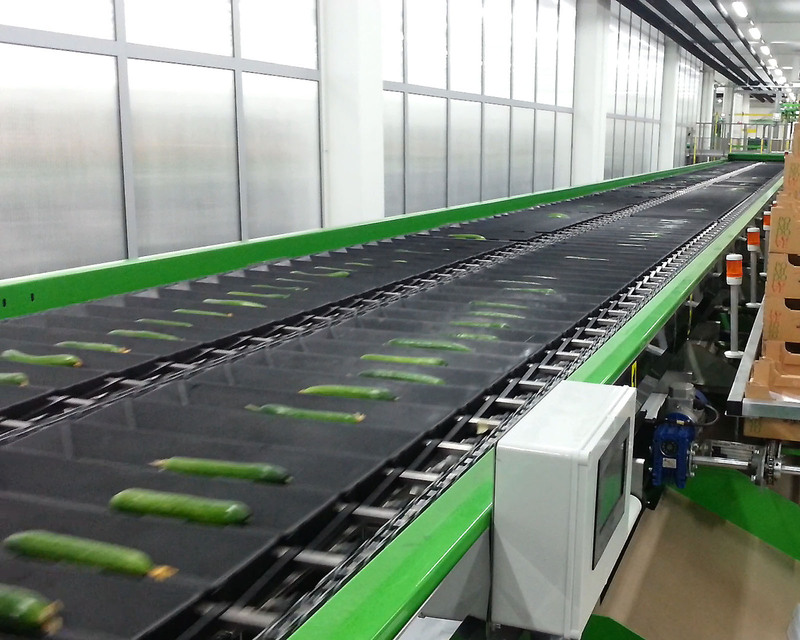 The Longway is an electronic cup grader for the high-speed grading of all long and cylindrical produce: cucumbers, courgettes, aubergines, etc. Despite its high speed (up to 300 cups/min), this grader is equipped with a relatively precise weighing system: to within +/-0.5% of the cup payload. The Oneway IV is an 88.9 mm/112.5 mm/152.4 mm-pitch weighing cup grader suitable for the grading of fruits and vegetables up to a maximum diameter of 120 mm. It is a very fast grader (600 cups/min/lane), with a simple, reliable and protected mechanism, and is easy to maintain. The INTEGRA is a grader that can work with fruits of a wide variety of sizes. It guarantees delicate processing of the fruit from the pre-singulation phase. The INTEGRA has been developed to check for defects and sort according to colour, weight, size, shape, volume and density, for regular-shaped products. The robustness of the INTEGRA guarantees cost-effective technical maintenance, since little maintenance is needed throughout the service life of the grader, compared to most other machines available on the market.